The Israeli Occupation forces has escalated its attacks on Gaza Strip in a very dangerous manner and started attacking civilian buildings, media buildings, and other buildings killing until now 3 people and creating a state of war against The Palestinian people in Gaza Strip, this has happened today after Israeli occupation special forces sneaked last night into Khan Younis under the cover of fighter planes which attacked several areas killing seven people and creating a lot of devastations in the area. 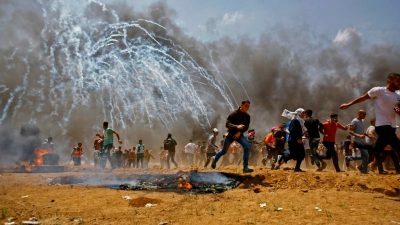 Friends and Comrades, we urge you, along with the rest of the international community, and all its institutions including regional ones, and the various civil society organizations, to send urgent calls for justice to the Palestinian People and support their struggle against the Israeli occupation and work in line with your responsibility as actors in this issue. We urge you to hold Israel legally accountable in both individual and a collective context, to immediately stop the aggression and war crimes on Gaza Strip and create the necessary pressure to force Israel to abide by the international law, specially the Geneva convention of 1947, we also urge you to work in collation to alienate Israel via boycotting the Israeli military occupation. We urge you to collectively work on a global solidarity campaign, the biggest of its kind, to expose the Israeli military occupation and hold it accountable for the crimes it is committing against the Palestinian People. The continued international silence and the lack of accountability gives the Israeli military occupation impunity and encourages it to commit more atrocities and massacres. We as a people under occupation, and under the control of an apartheid state, are being exposed without any protections. We urge you to take to the streets, and to hold nonstop protest as we do, we need you to raise your voice against the Israeli violations that are inflicted on the Palestinian people. We urge you to demand an end to the occupation and the aggression, and to shout against injustice. We urge you to take a stand against the double standard of the governments who are backing the last occupation in history, and to urge them to commit to their legal and ethical obligations towards protecting civilians in Palestine. We need your solidarity with us and we need it today, and every day, to help us stop the occupation’s crimes and its continued aggression. We urge you for a serious movement and a continuous solidarity actions towards a just struggle for justice, dignity and freedom. Finally, we hope that you commit yourself to this call today as individuals and/or organizations, and to do so with urgency, as tomorrow maybe too late. Salah Abdelati is one of the coordinators of the Great March of Return and its legal representative.